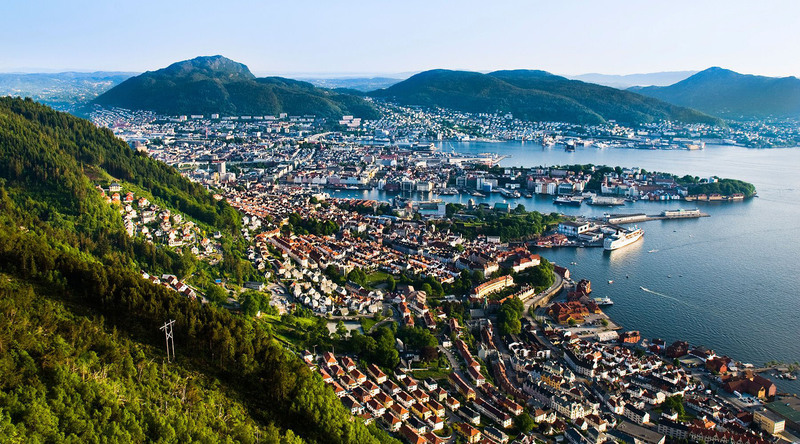 Bergen, Norway is the gateway to the fjords and probably the most beautiful city in Norway. It rains some 250 days a year and is very expensive. The people are nice, the food is good and there’s a lot to see and do. There’s nothing stressful or outlandish about Bergen itself at all. So after three visits, I was thinking 'why do I like Bergen so much?' The answer is Bergen, Norway is simply a nice place. I first came to Bergen 10 years ago, and I liked it even though it rained the entire time. I returned in 2012 and the weather was pretty nice and I remember thinking I liked Bergen and the whole Norway in a Nutshell tour again. Now, after just visiting for the 3rd time and it raining or at least being cloudy the majority of the day I can plainly say I like it again. I arrived in Bergen onboard the Azamara Quest, after four unique days in Edinburgh. I wasn’t too keen on doing too much in Bergen in the rain as I had pretty much seen and done it all in the past, but I signed up to hike to the top of Mount Floyen. I wanted the exercise and the photo opportunity. In order to climb, Mount Floyen, you take the funicular up to the staging area that gives great views of Bergen below. From the staging area, which features a restaurant, souvenir shops and an awesome troll statue, it’s about 2.5 miles up to the peak and about 800 feet in elevation change. It’s not a difficult hike at all, but it’s pretty scenic and well worth it. There are several little ponds along the way and then the views from the top are fabulous of Bergen and the surrounding islands and hills below. It rained for much of the hike, but the clouds did start to lift as we approached the summit. That made for cool photos with ominous cloud formations. Back in town, I met up with some friends from the ship for lunch. First, the fish market on the harbor in Bergen is top notch and well worth a visit and a meal. The crab, shrimp, lobster and pretty much any form of seafood you can imagine is divine and the displays are mouthwatering. We ended up settling on a restaurant I cannot remember the name of, spell, or pronounce as Norwegian is a very difficult language but I did get a whale steak and it was fantastic! We also ended up buying some massive crab legs to eat on the ship during this cruise! I can’t wait! When you visit Bergen, you'll love the simplicity of the destination. Walk around, talk to people, have a coffee or a drink and take it in because Bergen, Norway is just a nice place. Browse upcoming voyages to Bergen, Norway.